An interesting article from the Harvard® Business Review (hbr.org) reveals what we have preached for years: when it comes to hiring good sales representatives, forget the resume, the industry experience and the hard skills. Rather, focus on the needed soft skills and behavior-related characteristics. It is estimated that direct replacement costs for a telesales employee range from $75,000 to $90,000, while other sales positions can cost a company as much as $300,000. And these numbers don’t reflect the lost sales while a replacement is found and trained. So how do improve your hiring while reducing your sales force turnover (the US average being 25 to 30%)? 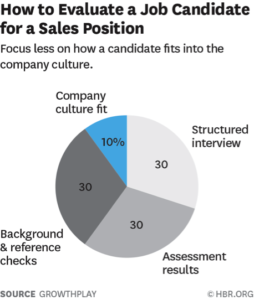 The chart below suggests that more emphasis should be put on assessing a candidate’s soft skills in relationship to a specific job environment. Does the applicant’s behavioral package fit with the job and vice-versa? Our Recru-Tec™ Test also perfectly fits with the suggested soft-skill approach to job fitting assessment. To evaluate job-related soft skills and measure how they fit (or not) your specific work environment, use the Recru-Tec Test. With a precision of over 90% it guarantees to detect what you did not see during an interview – no matter how structured it is.